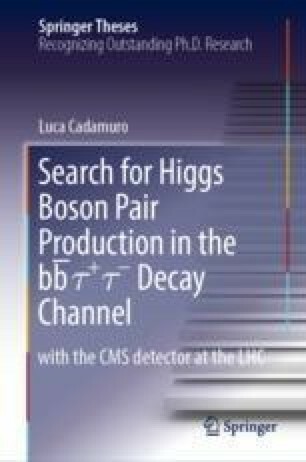 The exploration of Higgs boson pair production in the Open image in new window decay channel requires the experimental capability to identify and reconstruct several different types of final state objects and to use them for the selection of signal-like events. This in turn requires the reconstruction of the Open image in new window and Open image in new window decays and the usage of their properties to identify the specific signature of signal events and to reject background ones. These selections and techniques globally constitute the “analysis strategy”, the backbone of the Open image in new window search to which this chapter is devoted. After introducing the experimental challenges of the Open image in new window decay channel, the discussion focuses on the experimental signature of the signal processes under study and on the main background sources, and on the analysis strategy developed. The analysis strategy description is structured in four main parts, corresponding to trigger requirements, object preselections, event categorization, and definition of the signal regions.